A favourite finishing session of mine discovered via Nike Training and the coaching staff of Barcelona. 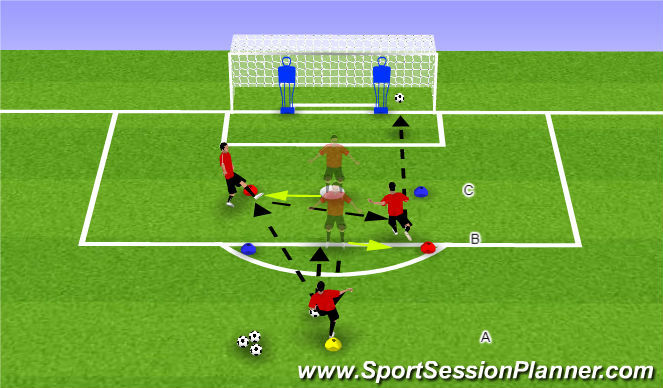 It involves short passing to get into the box, movement and quick decision making. Encourages players to make decisions by looking around them to know, where the space is, where support is and where the goal is before receiving the ball inside the penalty box. 3 Players & 2 mannequins/flags to replace a GK if not available. Player &apos;A&apos; starts about 5yds outside the penalty boxy. Player &apos;B&apos; is on the top of the penalty box. Player &apos;C&apos; is in line with the penalty spot. The cones are about 1.5yds inside the goalpost, 5yds apart. Play always starts with Player &apos;A&apos; rolling the ball out of his/her feet. Rotation is A to B to C to A.